Instruction to students: This is an individual assignment. This assignment is divided in 3 tasks. To fully engage with the subject’s material, it is expected that you actively engage with the modules and the subjects’ readings. and appropriate referencing where appropriate. The objective of this assessment is to discuss your ideas related to a focused health assessment of your case study patient. A focused health assessment concentrates on a specific area of concern, for example if a patient is breathless, then your assessment should include a respiratory/cardiovascular and functional assessment. From the attached case studies, select one case that you find interesting. Your case study will include a number of findings that will assist you in discussing your case study patient. 1. Describe the sequencing of your proposed assessment. 2. In relation to the health history, what questions will you ask? How do these inform your proposed assessment? 3. Analyse the findings of both the health history and the focused health and clinical assessment and relate these findings to the underlying disease pathophysiology. 4. Evaluate the significance/non-significance of these results. 5. Formulate a plan of care for your selected patient, using appropriate nursing literature to support your care decisions. It is essential that a clear relationship between the health history, the assessment and the process of care be outlined in your case study. Your case study must demonstrate your clinical judgment. Submission: Your assignment will be submitted into a Turnitin submission box within the SNPG962 Moodle site. The purpose of this assessment is for you make judgements about your learning this session. Integral to professional practice is the ability to self- assess and make judgements about your own performance. The RN Standards for Practice require that you have this capability. week as well as at the completion of each module. Your journal will not be marked but should provide rich data for the self-assessment. 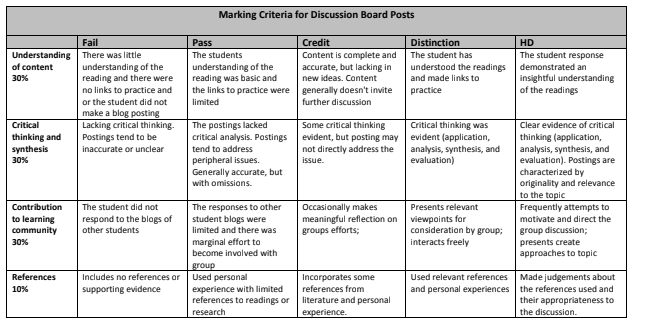 Your online discussion posts can also contribute to this assessment. Learning Outcomes- Look at the subject learning outcomes, describe your thoughts and feelings at the beginning of the semester, how did you responded to them? Reflect on your development over the session, how did you change? Did you have other personal learning outcomes for the semester? If so, what were they? Evidence – what evidence is there that you have met both the subject and your personal learning outcomes? Did you goals and personal learning outcomes change? Give some examples of the ways in which you can demonstrate the achievement of the learning outcomes and changes in your behaviour or practice. You might use evidence from your reflective journal/discussion forums. 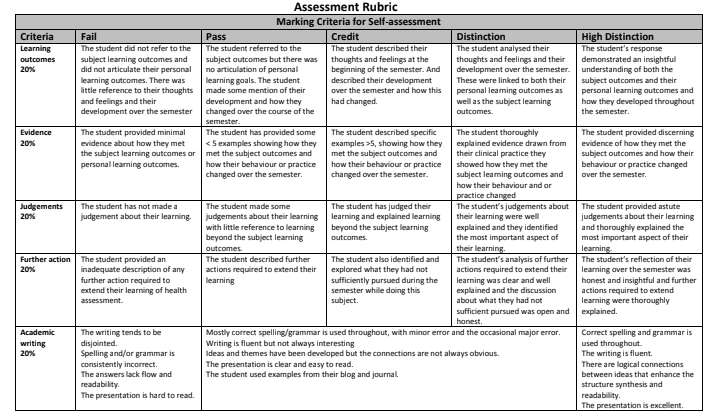 Judgments- what is your assessment of your learning in this subject? Are there things you have learnt in the subject which were not related to the set learning outcomes? What is the most important thing you have learnt? Further Action – what further actions do you need to take to further extend your learning and what aspects do you feel you have not pursued sufficiently within the confines of this subject? Your self-assessment needs to contain sufficient information to enable the subject coordinator to ascertain what learning activities you have engaged in and what you have learned. You can present your self-assessment in whatever form you consider appropriate, for example, a description under each learning outcome or tabulated in a chart. 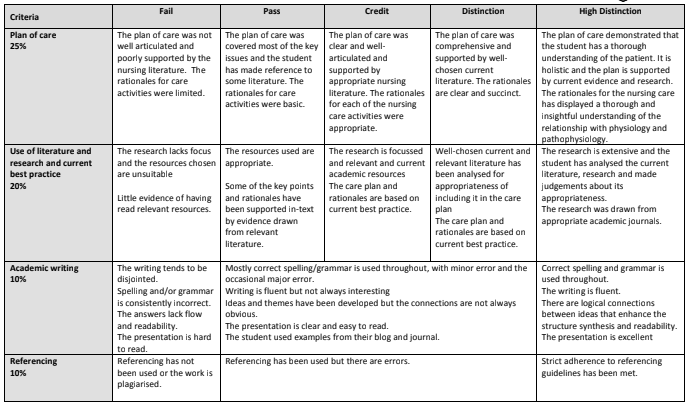 It would be appropriate to include extracts from your journal in your self-assessment. Attachments may be appended to indicate evidence. Get CNA253/255 Clinical reasoning case-study Assignment written by experts.